Boko Haram, an Islamist religious sect and terrorist group, believes that Nigeria is run by non-believers, even when Nigeria had a Muslim president. The group's goal is to establish a fully Islamic state in Nigeria, including the implementation of criminal sharia courts across the country. The sect calls itself Jama'atul Alhul Sunnah Lidda'wati wal jihad, or "people committed to the propagation of the prophet's teachings and jihad." The name, Boko Haram, was given to the group by residents of Maiduguri, Borno state where the group was formed. 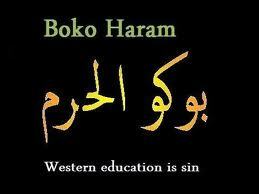 "Boko" means "fake", but is used to signify Western education, while "Haram" means "forbidden", so Boko Haram colloquially translates into "Western education is sin." Boko Haram's origins are believed to have been influenced by the teachings of Maitatsine, Mohammed Marwa, a Muslim fundamentalist, who rejected the influence of the education system imposedd by the British when they conquered the Sokoto Caliphate in 1903. Its followers also strictly adhere to a phrase from the Koran which states, "Anyone who is not governed by what Allah has revealed is among the transgressors". Boko Haram followers, called Yusuffiya, include hundreds of impoverished young northerners, students and professionals, many of whom are unemployed. There have also been allegations that the group is sponsored by members of Nigeria's elite and ruling political class. Boko Haram was created in 2002 by Mohammad Yusuf (1970-2009), a radical Islamist cleric, in Maiduguri, Borno state, in northeastern Nigeria. He set up a religious complex, called Markaz, following his expulsion from two mosques in Maiduguri by Muslim clerics for propagating his radical views. The complex included a mosque and an Islamic school. Many poor Muslim families in Nigeria, and neighbouring countries, sent their children to the school to get a proper education which the government of Nigeria has failed to provide. The centre had ulterior political goals to to create an Islamic state and impose Sharia laws, and it soon became a recruiting ground for future jihadis to fight the state. For the first seven years of its existence, Boko Haram's operations were relatively peaceful, and they typically only criticized northern Muslims for participating in what the group considered to be an illegitimate, non-Islamic state, but in 2009 the government began investigating reports that Boko Haram members were arming themselves, and when Boko Haram members defied a ban on riding motorcycles without helmets, this led to deadly clashes with Nigeria security forces. The incident was suppressed by the army and about 700 people are estimated to have been killed. The group's founder, Mohammad Yusuf, was also arrested and was later killed while still in police custody. His father in-law and other sect members were also killed in circumstances which human rights groups have called extra-judicial killings. Mohammad Yusuf's lifeless body was shown on television and the security forces declared that Boko Haram had been eradicated. However, after Mohammad Yusuf's death, Boko Haram carried out its first terrorist attack in Borno state in January 2010 and four people were killed. Since then, Boko Haram has increased the frequency and intensity of its attacks with increased suicide bombings and assassinations spreading from Maiduguri to Abuja. Experts believe that the group's influence will only diminish when the Nigerian government begins to reduce the poverty in the North and builds an education system supported by the locals. Jan 2012: A key suspect in the 2011 Christmas Day bombing in Abuja, which killed more than 40 people, escapes police custody. Jan 2012: Two soldiers and four BH gunmen are killed in an attack on a military checkpoint in Maiduguri, Borno State. Soldiers arrest six high-profile BH members in a raid on a sect hideout in the city. Jan 2012: Boko Haram kills four and injures two others, including a policeman, in two separate attacks on pubs in Yola (Adawama State) and Gombe city in neighbouring Gombe State. Jan 2012: Four Christians killed by Boko Haram gunmen in Potiskum,Yobe State, when gunmen open fire on their car as they stop for fuel. The victims had been fleeing Maiduguri to their home town in eastern Nigeria. Jan 2012: A Boko Haram attack on a beer garden kills eight, including five policemen and a teenage girl, in Damaturu, capital of Yobe State. Jan 2012: Boko Haram gunmen shoot dead a secret police operative along with his civilian friend as they leave a mosque in Biu, Borno State, 200km south of the state capital, Maiduguri. The president says BH has infiltrated the executive, parliamentary and judicial wings of government. Jan 2012: Three Christian poker players are killed and seven others wounded by BH gunmen in the town of Biu. Jan 2012: Eight worshippers are killed in a shooting attack on a church in Yola. Boko Haram gunmen shoot dead 17 Christian mourners in the town of Mubi in the northeastern state of Adawama. The victims are friends and relations of one of five people killed in a BH attack on a hotel the previous day. Jan 2012: Six worshippers are killed and 10 others wounded when Boko Haram gunmen attack a church in Gombe city. January 2012: Boko Haram launches bomb attacks and heavy gun battles in Kano targeting the police headquarters. Over 150 people reported killed. January 2012: President Goodluck Jonathan says Boko Haram has infiltrated government, including the executive, national assembly and the judiciary. January 2012: President Goodluck Jonathan declares a state of emergency in 15 local government areas in Borno, Yobe and Plateau states and also orders the closure of Nigeria's land borders in the north. December 2011: Christmas Day bomb attack on Saint Theresa Catholic Church in Madalla, Niger state, near Abuja. One policeman is killed in a failed bomb attack on a church in Jos, Plateau state. November 2011: Boko Haram announces that it will not hold talks with the government until all members of the sect, who have been arrested, are released. September 2011: Babakura Fugu, brother-in-law to late Boko Haram leader, Mohammed Yusuf, is shot dead two days after attending a peace meeting with ex-President Olusegun Obasanjo. Boko Haram denies any involvement in the incident. August 2011: UN headquarters in Abuja is bombed. Boko Haram claims responsibility for the suicide bomb. 23 people killed. July 2011: Federal government states that it will create a panel to initiate negotiations with Boko Haram. August 2011: Federal government rejects negotiations with Boko Haram. June 2011: Muslim cleric critical of Boko Haram, Ibrahim Birkuti, is shot dead by two gunmen on a motorcycle. December 2010: Attack on Army barracks in Abuja. December 2010: Bombings in Jos, Plateau state and Maiduguri, Borno state kill about 80 people. September 2010: Boko Haram members attack a prison in Bauchi and freed hundreds of prisoners, including about 100 members of the sect. July 2009: Mohammed Yusuf, leader of Boko Haram, is captured by the Nigerian army and handed over to police. He is found dead later and the police claims he was killed while trying to escape. Residents and human rights groups claim that he was assasinated. June 2009: Boko Haram members refuse to follow a motor-bike helmet law. Clashes with joint military and police occur, and 17 Boko Haram members are killed. Mohammed Yusuf releases a video recording to the president where he threatens revenge attacks. 2007: Buju Foi, an influential Boko Haram member,is appointed by Borno state governor, Ali Modu Sheriff, as commissioner of religious affairs.